I've been critical before about Health Canada and our government's warm embrace and inclusion of Canadian food industry lobby the Food and Consumer Products of Canada's (FCPC) on governmental panels setting policies or recommendations. For instance I thought it was beyond obscene that among the 12 members who made up Canada's Food Guide's advisory committee one was Carolyn O'Brien, then the Director of Scientific and Regulatory Affairs at the Food and Consumer Products Manufacturers of Canada. 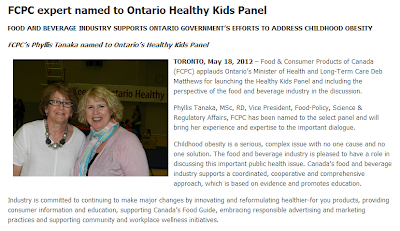 I was horrified to learn that the FCPC had joined Canada's then Minister of Health in rolling out a watered down, worse than nothing, voluntary set of guidelines for the food industry and their predatory practice of targeting children. And I was beyond disappointed to learn that the FCPC Vice Presient Phyllis Tanaka was invited to join Ontario's Healthy Kids Panel as a full voting member. So why do I have such a hate on for the FCPC? Well I don't actually. I think the food industry needs organizations like the FCPC to represent their interests - it's just that I don't think Health Canada or our government should expect the FCPC to do anything beyond trying to represent their interests. Meaning that give them a vote and that vote's not going to be used to further public health aims, it'll be used to further the aims of FCPC member companies. And so why this post rehashing everything? • Maintaining a profile and good relations with Health Canada bureaucrats with responsibilities for files of importance to FCPC member companies. This would include proactively establishing opportunities for Health Canada to meet with members on strategic files. • Maintaining a communications process between Dietitians of Canada (DC) and FCPC to share positions and perspectives on food and nutrition policy and regulatory issues and facilitating efforts to bring the industry dietitians’ perspective to the fore in DC’s development of policy and positions on issues that affect industry. Federal Level: working with member companies to respond to Health Canada consultations on food and nutrition policy and regulatory issues; maintaining a profile and good relations with key stakeholder groups with vested interest in federal level food and nutrition policy and regulatory issues. Provincial Level: working with VP Provincial Affairs to develop technical input to government relations strategies on provincial based food and nutrition policy and regulatory issues. Within FCPC providing food and nutrition related technical support to the Regulatory and Public Affairs Team; and acting as an industry spokesperson with media, NGOs and other audiences as required." So Health Canada and DC, the next time you invite FCPC to the table, remember, they're there, understandably, to protect their members' interests, and if those interests don't coincide with public health, don't expect them to change, instead expect them to work tirelessly and vigorously to try to fight your health improvement efforts.